Samsung just announce it’s latest addition GS4 a phone that Android can really be proud of. With a 5 inch 1080p 441ppi screen (using as always Amoled technology) and a mind blowing 1.9 quadcore processor powered by 2GB or RAM this phone can actually claim that IS better by many laptops out in the market right now. As expected the new camera is a whooping 13megapixels wonder that gets an even more enhanced experience by the new software featured added that allow you to add voice to photos and take short, gif like animations. A S4 introduces a bunch of new technologies like eye tracking for videos, image recognition for text and imagery, screen proximity events and excellent connectivity with S4 and Samsung devices. Finally the design got a bit streamlined and became “premium”, but it still made of plastic, almost a hybrid between S3 and Note with the addition of polycarbonate chassis which protects the corners of the device. I actually quite like the fact since my S3 looks like it passed through a warzone after 6 months of use. The phone will be going into stores at some point within the second quarter of 2013, and do note that the already overpowered CPU will be double as strong as the American version (see above) for Europe. Yes, we are getting an 8 core CPU, just because we are cooler. For those of you that don’t know TicTrac, TicTrac is an awesome tool that keeps your activities in one place and allows you to track them over time. I have started using it about a month and a half ago. In the beginning I thought I wouldn’t be using it much I find myself completely hooked on it (the fact that all my FitBit activity is linked there as well helped a lot). Almost a week ago I have received my first TicTrac update email, and I must admit I was absolutely stunned by the beauty and the structure of the report. Simple minimal design focusing in just one of the many aspects of what the website tracks. The webmail utilizes the branding guidelines of the company in a very refined way. It feels like something that came from TicTrac without overdoing it. Overall, excellent UX. I believe that they struck gold by understanding that in most cases people don’t have time to read long bodies of text. The report keeps copy to a minimum, focusing mostly on nicely designed graphics that convey the idea and are pretty engaging. In addition they have placed their call to action right in the middle of the email, and it is not a stupid reasonless call to action it’s a push to get you to use the thing even more. Kudos. There is a very subtle “social” aspect to it since it allows you to share the repost via facebook and twitter without showing off the needless facebook / twitter logos that you can see now days everywhere, and kind of lost their meaning. 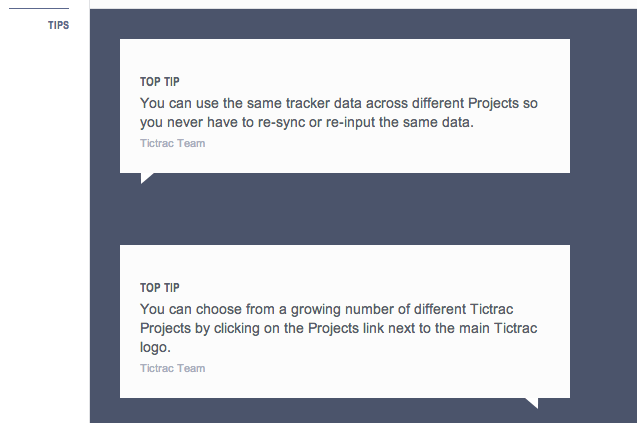 TicTrac is a new kind of service, and as with everything new there is a learning curve. TicTrac decided to end the report with a list of tips of how to use the system more effectively, which I find really smart. Finally, nothing can be perfect. The share to Facebook and Twitter links seem to be a bit buggy, or badly thought. The twitter post contains only a non-obfuscated AWS/S3 link followed by the url of the website which actually has a space in between which makes it render really badly. My advice would be. My thoughts? I loved it. It made me to engage even more with the website, that much I had to write an article about it. 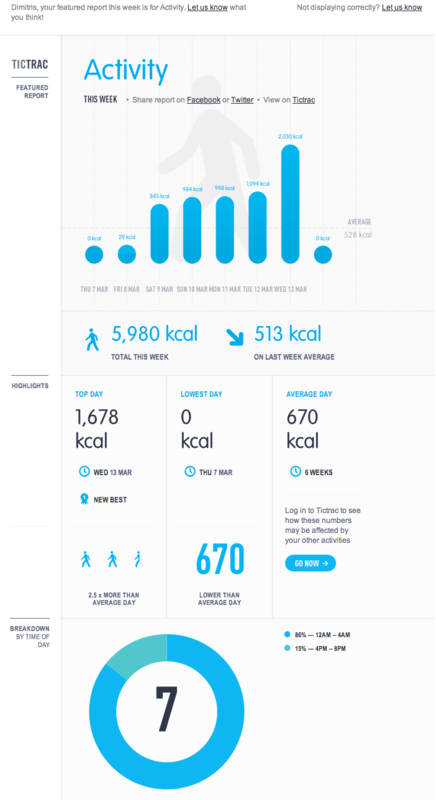 If you don’t have a TicTrac account and you do have a life goal, like becoming healthier, tracking or loosing weight, or you are just a statistics buff, go get an account and tell me what you thing about it. And then, then I did some thinking and things started to make no sense. Ok Jet Engines, Electronics, Car engines don’t work because “the physics went all wrong” but … semi-automatic weapons can fire? Any sort of a weapon uses more or less the same laws that an internal combustion engine is using. Trying to support the theory of the series I thought, well maybe there is something that tampers with Electric fields so electric engines or engines that use an electronic ignition won’t work… Well yeah … our neural system is kind of REALLY using electric impulses to function so if there was something tampering with that we were utterly ‘le fucked’. The other possibility would have been that a really major EMP of some sort hit the earth, after some reading actually this might be a possible explanation. A long lasting period of solar activity can stop communications and electronics from working and can also tamper with electric power generation. In this case, steam engines will work. Guns will also be able to fire. Internal combustion engines will have a huge problem to start running because the ignition requires kind of a strong electric current to fire up the fuel. So yeah .. that’s a possibility, not very strong but that’s at least within the realm of possible. What do you think? Any other ideas or arguments? Samsung’s window comes with blinds too! Samsung has designed a window that doubles as a monitor, allowing users to look outside while surfing the net. Samsung’s ‘Smart Window’ works like a touch screen, allowing users to select a variety of apps and functions with a touch of their fingers. Users can even ‘draw’ the windows blinds by simply sliding their fingers down the screen. From the videos below, the window demonstrates the ability to surf the web, watch videos and even give presentations. The window is reported to be eco-friendly, as it runs on LED lights and is partly powered by solar energy. Could this be the future of windows in our homes? And if that’s the case would Janet let me put those on our bedroom?